↑ Смит Г. «Хоуп» // Драгоценные камни = Gemstones / под ред. д-ра геол.-мин. наук В. П. Петрова. — 2-е изд. — М.: «Мир», 1984. — С. 233—235. — 558 с.
Marian Fowler, Hope: Adventures of a Diamond, Ballantine (March, 2002), hardcover, ISBN 0-345-44486-8. Janet Hubbard-Brown, The Curse of the Hope Diamond (History Mystery), Harpercollins Children’s Books (October, 1991), trade paperback, ISBN 0-380-76222-6. 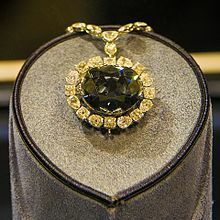 Richard Kurin, Hope Diamond: The Legendary History of a Cursed Gem, New York: HarperCollins Publishers & Smithsonian Press, 2006. hardcover, ISBN 0-06-087351-5. Susanne Steinem Patch, Blue Mystery : The Story of the Hope Diamond, Random House (April, 1999), trade paperback, ISBN 0-8109-2797-7; hardcover ISBN 0-517-63610-7.